I've added the "conversion factor" to be clear what this formula effectively does. It takes a social cost of carbon (SCC) per weight of carbon emissions, less the value derived from the Regional Greenhouse gas Initiative (RGGI), converts the carbon weight cost to an energy unit cost at a factor that is reflective of emissions from one megawatt-hour of electricity generated from a Simple Cycle Gas Turbine (SCGT), including impact of NOx emissions, and then subtracts any market proceeds above $39/MWh. ...The nuclear subsidy comes to $17.48 per megawatt-hour of electricity for the first two years. By contrast, in recent years, procuring renewable power has cost New York about $22 to $35/MWh under state mandates. The $17.48 figure is from appendix E (.pdf) attached to the ruling (.pdf) of public service commission. Specifically, it's $42.87/short ton SCC value less $10.41/short ton RGGI, totalling $32..47/short ton, times a conversion factor of 0.53846 yielding an adjusted rate of $17.48/MWh. Aside from an even more ridiculously low RGGI carbon price (yet another inadequate cap-and-trade scheme) this is essentially as high as the ZEC (zero emissions credit) can be until the social cost of carbon increases. If the market price, plus capacity costs, rise above $39/MWh, the ZEC payout drops. This zero-emission credit is a hefty subsidy. New York’s ratepayers will pay up to $965 million to Fitzpatrick, Ginna, and Nine Mile for the first two years of the program, with adjustments made thereafter through 2029. (The subsidy will shrink if electricity prices rise, per the formula above — or vice versa.) It’s a bailout, it’s not cheap, and there’s a reason various environmental groups are displeased. No, not really "or vice versa". The $965 million is 2 years of generation from qualifying nuclear generators (55.2 terawatt-hours) at the $17.48 ZEC. So what subsidy is this reflective of? It's the social cost of carbon not recovered by the regional cap and trade scheme on 55.2 TWh of SCGT generation, as natural gas-fired generators, exempt from paying for emissions, drive down the market price - necessitating new schemes to keep low emission sources operating. It seems to me arguing this is the subsidy is arguing carbon should not be priced. Surely this is not what Brad Plumer and Jesse Jenkins wish to argue - but it's implied in the use of the term subsidy. “Instead of giving nuclear some reward … it would be more appropriate to sanction those acting badly," said Dave Lochbaum, a nuclear expert at the Union of Concerned Sciences, a watchdog group. A carbon tax on fossil fuels would have the effect of rewarding nuclear, wind and solar, he said. Fair point - but nobody should pretend the agreements in New York, or elsewhere, would be near as urgently required if carbon was priced to the extent the government claims it should be - and the Clean Power Plan did not neglect the contributions of well maintained legacy generators. Furthermore, assuming throwing nuclear units a bone will cost consumers more than an alternative of closed nuclear plants - with consequential spiking prices, lowered reliability and increased emissions -is wildly speculative. Tough to put a number on that cost, but I'm guessing it'll be more than nuclear's. Then, more recently, we have BHP threatening temporary closures until the [South Australia] Government persuaded the Pelican Point gas-fired power station to re-open. Large manufacturers of any kind don’t like unreliable power or power spikes. Nor do lesser mortals. Today Tonight’s Hendrik Gout was out interviewing Riverland fruit and wine producers being hit by price spikes. Irrigated farming is all about big really big pumps, and a sound can be worth a thousand pictures … ask yourself why is a fruit grower who could be using the grid running a bloody big diesel generator? What level of stupidity or incompetence could make SA electricity the second choice behind diesel? I don't think the issue is NEM nearly as much as RES (renewable energy standards) or other quote systems - but if Geoff Russell's point is a focus on variable renewables coincides with removing focus on providing power at all time, that's possible. Nobody has ever built a 100 per cent renewable electricity system at any kind of relevant scale and nobody has a clue how to deal with the inconvenient events that we know need handling. The current problems are just a taste of things to come if our governments continue to allow our energy supply to operate like a casino instead of actually doing what they were elected to do – governing. Both exaggerating the costs of nuclear and ignoring the systemic costs of integrating larger shares of wind is apparent in the flurry of comments in the U.K. following the new May government's delay of a decision on the Hinkley C nuclear project. 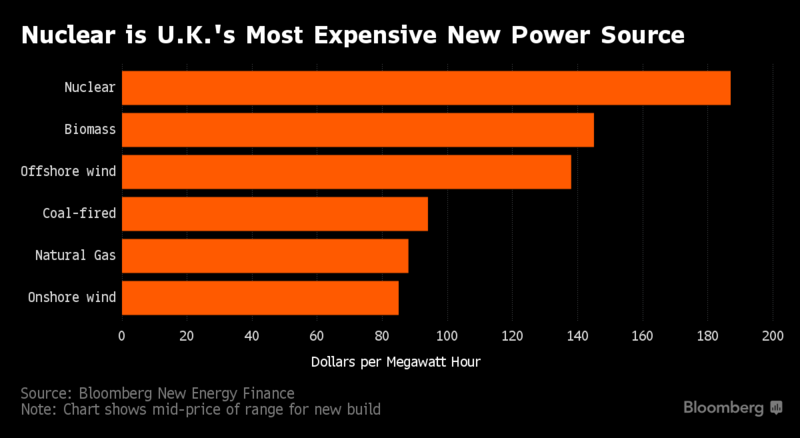 I can't say I am entirely surprised the U.K.'s new Prime Minister delayed a decision on EPR's at the Hinkley site. When her final announcement does come it will be hers to own - not an inheritance from her predecessor she would get no recognition for if all goes well, but would wear the embarrassment if all does not. Newspaper stories abound with critics of the project feeling vindicated, indications of indignation out of France and China at the slighting of the delay, but there's little on the actual deal. The BBC produced Reality Check: How much would Hinkley C cost bill payers? ...the UK government has guaranteed EDF a fixed price for the electricity it produces for 35 years. Claims of subsidy assume a persistently low market price - which may be true, particularly if carbon never gets priced. But the strike price is the stike price. unless you get your news from Bloomberg New Energy Finance (BNEF). Apparently BNEF thinks the pound is going to become way, way, way more valuable than the dollar. I'd like to rejig a sophomore paper I recall writing on the ontological argument for the existence of God Hinkley C's EPR reactors. The argument was existence is an attribute a powerful entity would possess - certainly if the entity was all powerful. The EPR should be a better choice than things that don't exists because EPR's should exist. it seems far more practical than pricing variable intermittent supply, such as offshore wind, and forgetting about that whole system functioning at all times requirement. There is only false choice between generators with capacity value and generators without capacity value, and we are far enough into the wind and solar experiments to stop pretending the cost comparisons based only on levelized unit costs are relevant - even fair ones. Prime Minister May should listen for when all the pundits, and interest groups, think her decision will be entirely hers. Aside from that, she can probably ignore them all. EDF should get an EPR reactor working - in Finland, France and/or China. That would help May to choose the EPR, as existence remains the only attribute that prevents it being today's most powerful choice for future low emissions electricity supply in the U.K.